Pulls most lengths or shapes of bullet without damaging or distorting jacketed bullets. Standard puller's interchangeable collets tightly lock onto the bullet as the case is pulled away, just like a draw collet on a lathe. 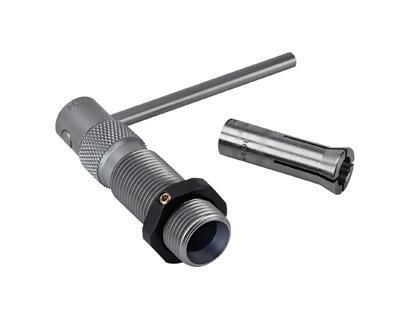 It utilizes the standard .875" -14 thread and may be used in any single stage reloading press having this thread size. *Order collets separately.